Because of Love is an excursion into the semiotics of the stage from a live artist whose work has chosen to omit its hierarchical aesthetics until now; engaged in the autobiographical, Franko B makes an incision into the fabric of memory through the ritual of re-call, avoiding the representational in favour of deconstructing – and succumbing to- the overt sentimentality and romanticism associated with memory. 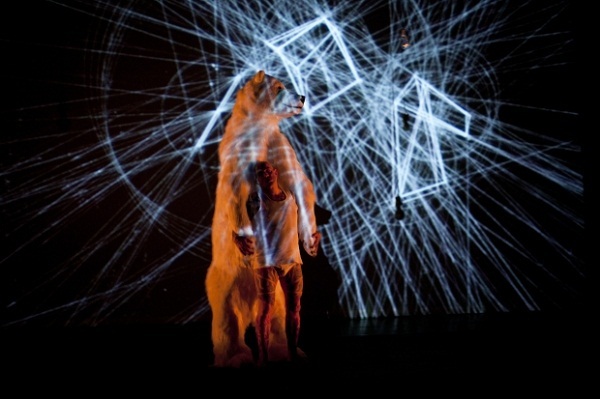 In this latest piece- a significant departure from his visual and body-based work, Franko B has crafted a series of memory-recalling and making processes, framed by the specificity of the stage, disrupted by the power of his autobiographical ritual and in dialogue with a series of practices: choreography, video, light, music. It’s a piece that toys with personal landscapes; less political than his previous work, with a strong material presence and a precise and evocative performance semantic that creates an iconography of memory, located both in its original state- part speculative, part fictional- and its source- the body. It’s not surprising to see Franko B engage in such a layered, emotive and atmospheric exploration of memory and sentiment- and the visual and physical languages of the piece are at times tightly woven, at others deliberately dissonant, drawing connections between the abstract layers of memory and the palpable emotions of reflection. Franko B has an imposing and inherently narrative stage presence- one that exists in a constant process of being. There is no stillness in Because of Love– time is moulded to a dream-like tone and atmosphere that is initiated by a movement-based ritual which, through repetition, wakes up the stage, creating the space for memories to occur. It’s an action recontextualized on the domain of the stage- and the shifting contexts that serve to frame it make Because of Love a nuanced and engaging piece, both humorous and nostalgic. Memories are at times tender, at others aggressive and slippery- but Franko calls to the iconoclasm of childhood to frame the performance, which also features a strong material presence, from taxidermy to the thickness of the mud which serves as a grave for time and memory in the piece, lining the entire downstage. Franko B’s own body is a map whose keys are unlocked with every scene- engrained with memories, open for navigation. The continuity of Franko B’s movement, its staccato repetition and its change of tone and quality throughout the piece are also a result of his collaboration with choreographer Gilles Jobin, notable for the development of a continuous movement defined through a certain engagement with verticality. Jobin’s engagement with the piece lies less in a visible choreography, but more in a precise relationship between the body and the space, and a surfacing of processes of remembrance in relation to the visual landscapes created onstage- from Nigel Edwards’s punctured and geometric lighting, to the eeriness and playfulness of Othon’s piano score. Thomas Qualmann’s animation mixes geometric patterns with footage of Laika in space, creating a series of shifting contexts for the unfolding memories. Franko B engages with the entirety of the stage’s conventions- he uses backstage, traces a geometry through both movement and light, and accesses the stage’s polyphony through video and embodiment- this time, it’s not just him, but an animatronic polar bear- a humorous but also tragic figment of his own memory, a father-figure engaged in a dance with time; an exacerbated dialogue with personal politics. Underscored by Othon’s beautifully haunting soundscape, this is a moment when overt sentimentality and confrontation happen two-fold. In the context of Franko B’s work, Because of Love is not only reliant and explorative of the body as document and site of emotion, but also seeks to create an engagement with the present by bringing ritualized practices in the landscape of memory. It’s as tender and honest as it is sharp and precise, but it’s also a highly accessible performance that speaks of our relationships- to ourself, our memories, our childhood, and the people around us. Because of Love is on at the Lancaster Institute for the Contemporary Arts on the 11th May and Colchester Arts Centre on the 27th May.